Fitted & Attached - Be cool when it's hot... Be warm when it's cold. - If you can ride it, we can fit it! - All sheep seats come with elastic in front and durable leather ties for easy on, easy off installment. 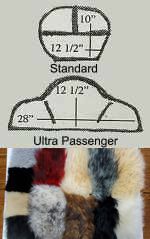 Sheepskin backrest covers in 12 colors, Standard ($30) and Ultra Passenger ($60) sizes. 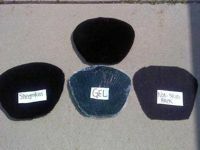 Sheepskin top, Gel middle and non-skid backing. Size: 14" wide x 12" long. 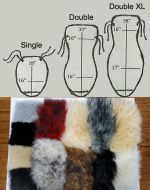 Our Sheepskin Western Saddle Cover fits 14" to 18" Western Saddles, with 16" of elastic loop on front and 12" of elastic on back. Great in front of a fireplace, car seat or bagger motorcycle. Does not come with with elastic or ties. Rabbit fur thong bikini with adjustable deerskin ties, and fur tail. No two are exactly alike. One size fits most. 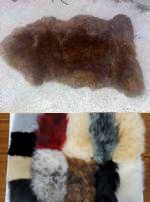 Page Summary: Wisconsin sheepskin seat covers, motorcycle seat covers, fur seat covers and motorcycle apparel for La Crosse, Onalaska, Sparta, Tomah, Holmen, Prairie Du Chien, Richland Center, West Salem, Viroqua, Westby, Bangor, Hillsboro, Lone Rock, Stoddard, La Farge and surrounding Vernon County Wisconsin communities.